In reference to: Joshua Stanton, “AP Exclusive: North Koreans say Kim Jong Il is like Jesus, only bigger!,” One Free Korea [blog], April 9, 2012. Yes, the AP should indeed have consulted a few historians about Kim Il Sung’s claims in “With the Century,” or Googled what Hwang Jong-yop had to say about Kim Il Sung’s 40-volume “Works” (neither Hwang nor the Works are mentioned in the article). Balance could have been better achieved through some reading or interview of Cumings, or Wada Haruki, or Dae-Sook Suh, etc. Journalists don’t always do so well with history, just like historians often stink when they try to write journalism. – Bruce Cumings _War and Television_, which, among other things, is a great first-person account of Cumings’ three visits to the DPRK in the 1980s which include an encounter with a dude in an elevator who had his face burned off in napalm raids, and a visit to the Sinchon Massacre site — The AP folks, and anyone, could read this text for pointers about how to disentangle lies from myth from fact from testimony from propaganda from experience from how to write about it, because it is clearly a confusing experience to be in North Korea, even when you think you know what you’re looking for. 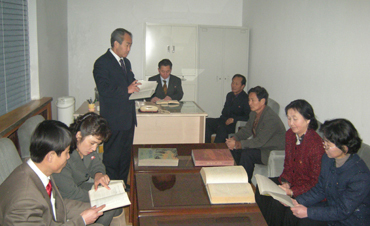 – Another source quite useful for finding out about the present memory of Korean War bombings was presented by an AlJazeera report that rehashed the 1952 biological weapons assertions, but at least did so by going into the countryside and interviewing “survivors,” in addition to getting led around in museums and going into Manchuria as well. Why mention either of these sources? Because memory of war trauma is a legitimate thing in most contexts (see: Europe, W.G. Sebald, _A Natural History of Destruction_, Japan, Richard B. Frank, _Downfall_) and because its investigation in North Korea because offers the possibility of an AP story which would force the agency to navigate through the muck of propaganda but at least partially expand the field of fact in the process, which I thought was the job of journalists. If this is impossible, then couldn’t we be upset rather because the AP has no such latitude to propose covering stories that are off the beaten track of escalation and cultural escape? Sure, reading their publishing agreement could be interesting, but it would also be interesting to read various university agreements that allow Western academics to teach at institutions like the Pyongyong University of Science and Technology. Where again is the harm in all this? Is any report by a Western reporter on a tour an act of complicity, because, presumably, North Korea is getting what they want? A great tie-in here is Laura and Lisa Ling’s engrossing (in the way that a car accident is engrossing) memoir that describes how skillfully the North Koreans used them to play the US media. It was pure virtuosity involving Anderson Cooper being co-opted. AP is small potatoes once you’ve remote-controlled Anderson Cooper and forced Americans to realize Oprah is powerless (both are revealed in the Ling memoir, now available in paperback!). To put it a little more bluntly, is an AP reporter responsible for a kid starving in Hwanghae province? Or the creation of a political prisoner? Does it take more courage for a Western author to write a memoir of a North Korean escapee or a book of serious analysis about the Mass Games? To take the “complicit Western reporter in Pyongyang” point a little further, should Mike Chinoy _not_ have gotten on that boat with Kim Il Sung and Jimmy Carter in 1994? Chinoy, after all, provided original insight into Kim Il Sung’s ease about having his GOITER photographed! That is some quality data. Stanton’s own exchanges with Chinoy were really valuable for the rest of us, but, unlike Chinoy’s book Meltdown itself, they did not result in an expanded knowledge of Kim Il Song’s and the North Korean press attitude toward his own most notable physical defect (defect apart from needing to wear glasses, that is — which is one very important difference which to my knowledge has never been remarked upon between the portraits of the two senior Kims and Jesus). But I’m not complaining. Also, if everyone (by which I really mean “American journalists”) just packed up and left Pyongyang, doesn’t that mean they’d be donning the old “Beijing filter” again? Or is the assumption that if they clear out, they would go to “free Korea” (Seoul, not Los Angeles), where it is technically illegal to read KCNA and Rodong Sinmun? Is it not necessary for AP, or any bureau for that matter, to actually read public statements by the North Korean state because it is all variations on a theme which really needs to be rebuffed via variations on Kafka’s “In the Penal Colony”? Is it necessary for every dispatch from Pyongyang to include the word “Stalinist”? Should books by Kang Chol Hwan and Blaine Harden be piled high in the AP bureau in Pyongyang? Sure, why not? Neither Xinhua nor KCNA is getting the job done, and the presumptive masses of North Korean dissidents (which B.R. Myers and Stanton disagree about the existence of) get less press than 26 self-immolating Tibetans. Against 30+ paragraphs that do not mention the gulags, apparently this is insufficient. But it is there. The Merits of Reverse Psychology | Perhaps instead, since they apparently plan to stay, couldn’t the AP consider trying the merits of getting relatively more access within in the DPRK by playing the North Korean game much, much harder and with more agility? or some coverage about Chinese diplomats and reporters in Pyongyang. Or don’t foreign delegations of reporters report on other foreign delegations of reporters? Maybe that’s bad form. But if Victor Cha is going to stay on his “North Korea is the same thing as a poor Chinese province” kick, it might be interesting to see if in fact Xinhua has internet access anywhere besides their hotels and at the Chinese Embassy in Pyongyang. Where is Robert Kaplan with a thunderbolt when you need him? Anyway, there are many feasible topics which the AP could go on the offensive with which would benefit analysts who are simply looking for more data points. If they can’t provide original data, sure, why not complain? If they have interesting facts to bring to bear (which might include bona fide evaluation of sources like “With the Century”), let them stay and do their jobs.